Painted in white, green and blue, as it were, it seems the royal craftsmen of yore saved the most exquisite jewels for this southern Rajasthani city – lakes, gardens, palaces, havelis, forts and temples – and scattered them this side of the Aravali Hills. Uniquely different from other cities in the state, Udaipur is where you drop the pace, kick up your feet and commune with nature. Pichola Lake and its many sights are a great introduction to Udaipur’s regal and affluent past. It also hints at what’s to follow as you travel through the region – marble and stone palaces, royal resorts, haunting cenotaphs and ghats that kiss the banks of tranquil lakes everywhere. Check in at a heritage guest house or hotel, and feel like a king; the hospitality is impeccable and food to die for. Once you’re done with Pichola, visit at least one more lake venue, and there are many to choose from! If you’re up for a bit of adventure, there are wildlife reserves within driving distance of the town. Surrender all that is urban at the gate and lose yourself in an enchanting world of twittering birds, scampering black buck and shy desert foxes. 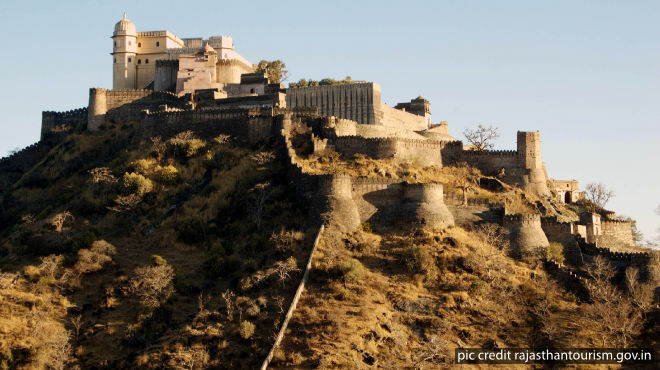 Finally, just 100 km from the city, a drum roll bellows through the mountains, calling you to the mighty Kumbhalgarh Fort. In Udaipur, time marches to a much slower beat, so check off at least four days to experience the best this former princely state has to offer.